The African Water Association is setting up research fellowships for young water and sanitation professionals in West Africa, as part of its Research and Capacity Building Program. This program, funded by USAID West Africa through the AfriCap Program (WASH – African Water Association – AfWA – Capacity Building Program –AfriCap), will provide young graduate students at the graduate level (Master II) with research scholarships. Each grant, amounting to $ 1,000, will reward each selected project in accordance with the budget. 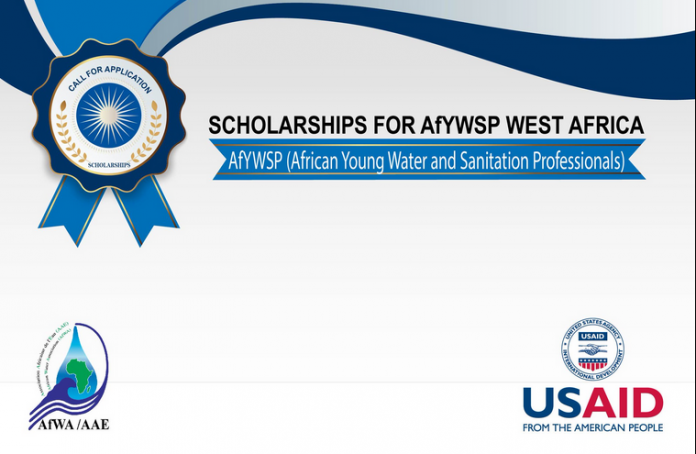 African Young Water and Sanitation Professionals (AfYWSP) scholarships offers a number of highly talented prospective young water and sanitation professionals the opportunity to do research in West Africa. In case of equality, preference will be given to the female candidate. African Water Association mission is to coordinate the search for knowledge and latest development in the technical, legal, administrative and economic fields for Drinking water production , supply and of sanitation and to promote the exchange of information on methods, processes and procedures of drinking water production and supply and sanitation. Scholarships will be awarded to graduate students at the graduate level (Master II) with research scholarships. Scholarship Award: Each grant, amounting to $ 1,000, will reward each selected project in accordance with the budget. Present an application file including the last diploma, the transcripts of Master 1, the curriculum vitae, three letters of recommendation (one should be from the academic supervisor), the research proposal as specified in section 1.3 above, a letter of motivation and a plan of action for the studies. Citizen of a West African countries (Benin, Burkina Faso, Ivory Coast, Cape Verde, Gambia, Ghana, Guinea, Guinea-Bissau, Liberia, Mali, Mauritania, Niger, Nigeria, Senegal, Sierra Leone and Togo) are eligible to apply for these scholarships. Applicants must have duly registered in their academic institutions. Applicants must speak and write fluently in the language used by the academic institution. Note: The date of publication of the list of beneficiaries for the 2016-2017 academic year is March 21, 2017. The selected list will be posted on AfWA’s website and each beneficiary will receive an official notification from AfWA. Applicants must submit their application electronically simultaneously to the contact person of AfWA in their institution and to the coordination of the program (vyao-at-afwa-hq.org and gdjagoun-at-afwa-hq.org).